Sunita Duggal is an Indian politician and former IRS officer. She belongs to BJP and is contesting from Sirsa Lok Sabha constituency in 2019 General Election. Sunita is quite popular for her personal charisma. 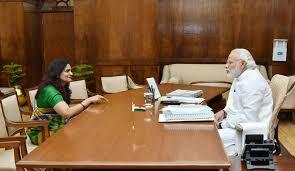 She was, in fact, in fray for 2014 Lok Sabha ticket from this seat. However, BJP didn’t take Sirsa as per pre poll alliance. Sunita had also fought the last Assembly Election from Ratia, an INLD stronghold. In mere 15 days, she had shown her prowess. Sunita comes from a highly educated family. Many of her family members are administrative and police officers. Her husband is also a HPS police officer. However, there isn’t as such any political connection of her family in the world of politics.